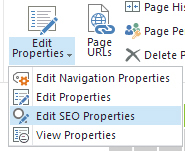 2 Comments on "SharePoint 2013 SEO Headaches – Managed Metadata Navigation “Feature” or “Bug”"
Our termstore management tool contains different termsets (trees) for topics, target groups etc. The terms itself are not only named with a single word but a word chain, example “E-Mobility/E-Solutions”. As you can see, we’d like ti use the Slash / as a character. Is this supported or not? “/” are supported in term sets and titles of terms, it will become harder with regards to navigation and these will have to be replaced for that to work.